PlBeautyNews is a beauty blog run by Philippa Lane, a professional freelance writer who also works for the Cable Muse Network. Philippa is a prolific writer who covers a broad range of subjects such as food, health, travel, appliances, beauty, books and automobiles. Philippa has been sharing her ideas and reviews on beauty and skin care ever since the year 2007 and her reviews have become famous for being quite trustworthy and genuine. In an article titled “Vine Vera Merlot Moisture Day Cream”, Philippa talks about the ingredient Resveratrol and how it can help your skin to retain a younger looking appearance as well as get rid of the existing lines and wrinkles. She goes on to describe Vine Vera as “a company that has researched for years on how Resveratrol benefits the skin and created a day cream that has a high concentration of Resveratrol in it”. 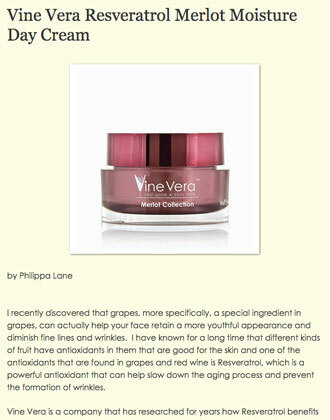 Philippa further reviews the Vine Vera Merlot Moisture Day Cream. “Even though the Vine Vera Merlot Moisture Day Cream does not contain a sunscreen, it is still an excellent product and can be a wonderful benefit for all skin types. Vine Vera would like to thank Philippa for showcasing our Merlot Moisture Day Cream on her blog and showering such praise on the product. We are also delighted to see the beautiful product guide that Philippa offers to her readers. We couldn’t have done it better ourselves.